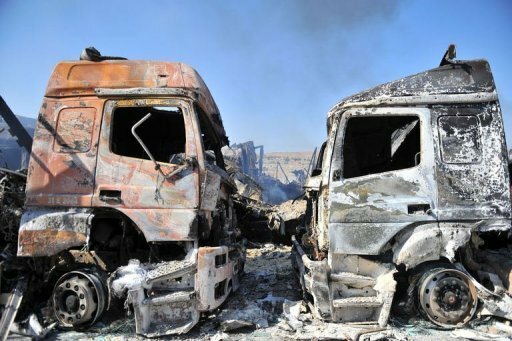 Dozens of Turkish truck drivers have accused Free Syrian Army rebels of having burned and looted their lorries as they captured a border post in Syria from government troops. A group of truck owners, traders and transporters who have braved Syria’s highways despite the bloody conflict have been waiting since Friday at Turkey’s Cilvegozu border crossing, opposite Syria’s Bab al-Hawa post. Free Syrian Army (FSA) rebel fighters captured the border post in their battle against President Bashar al-Assad’s loyalist troops. “We barely escaped when the rebel fighters took full control of the Bab al-Hawa border post in Syria,” said Hasan Abbasoglu, who retrieved his vehicle from Syria after the looting. While the truck was not damaged, its cargo had been ransacked. And he had to pay $700 (575 euros) in bribes to get his truck back, he said. Members of the Free Syrian Army had done nothing to stop the looting, he complained. Later Saturday, after a meeting of local officials, the governor of Hatay province in southern Turkey blamed “independent groups” for the looting, without providing further specifics. Nineteen out of 30 trucks had been returned to their owners. Another nine or so were burned out, and the rest were still being held inside Syria, Celalettin Lekesiz told reporters. Rebel fighters were seen handing out the contents of the lorries to local people Friday at the Bab al-Hawa border post on the Syrian side. By Saturday evening, a group of some 150 foreign fighters describing themselves as Islamists had taken control of the post. These fighters were not at the site on Friday, when rebel fighters captured the post. Some of the fighters said they belonged to Al-Qaeda in the Islamic Maghreb (AQIM), while others claimed allegiance to the Shura Taliban. The fighters identified themselves as coming from a number of countries: Algeria, France, Egypt, Saudi Arabia, Tunisia and the United Arab Emirates — and the Russian republic of Chechnya, itself prey to two brutal conflicts in the 1990s as Moscow clamped down on separatist militants. The FSA is made up of mainly army defectors fighting against the Damascus regime and some of its leaders are based in Turkish camps along the border. Speaking to reporters after visiting refugee camps in Turkey’s Hatay province near the Syrian border, Abdel Basset Sayda, leader of the opposition Syrian National Council (SNC), said the looting of lorries at Bab al-Hawa was “unacceptable” and blamed the looting on pro-government gangs. Thursday’s fighting saw Syrian rebels seize the border crossing with Turkey, prompting an all-out assault by the regime in Damascus to regain the lost border posts, also including one on the Iraq border. At Bab al-Hawa, just four kilometres (2.5 miles) from Cilvegozu, Syrian rebels ransacked customs buildings and pulled cargo from the back of stranded trucks. Few traders were as lucky as Abbasoglu, instead losing their vehicles or merchandise. Ali Celik, who runs a road haulage company, looked over the border into Syria, but he did not hold out much hope for his merchandise. His trucks were stranded at Bab al-Hawa. Turkey was a major economic partner of Syria before Assad clamped down on the uprising that erupted in March last year, badly straining ties between the two countries. Ankara has denounced the bloody crackdown, which has sent more than 40,000 Syrians across the border into its territory alone. The Turkish foreign ministry has repeatedly warned its citizens not to travel to Syria because of security concerns. Traders, however, argued that as long as the border crossing at Cilvegozu remained open, they have to keep trading via Syria in order to stay in business.